On July 12, 100 B.C., Julius Caesar was born by what many believe to have been the first Caesarian section. Today it is generally assumed that Caesar was not born by Caesarian section, as C-sections were only performed on dead women in Roman times, and there are many accounts of Caesar’s mother, Aurelia, being alive well into Caesar’s adulthood. So, how did this surgical procedure come to be associated with one of the greatest generals in recorded time? This belief has certainly been around a long time; and many Western names for the procedure include some derivative of Caesar in some form or another, for example the German name for it is “Kaiserschnitt” which literally translates into “Emperor’s cut”. Some believe this misassociation has its roots in the writings of the Roman author, Pliny the Elder. In his work on the Caesar family, he described the first Caesar as having been removed by an incision in his mother’s womb. 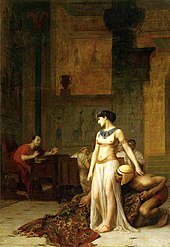 Of course Julius Caesar was not the first Caesar, as he came from a long line of Roman Republican statesmen bearing this family name and, save his son with Cleopatra, was technically the last. Whatever the exact origin, the surgical procedure is still properly named, just not for the Gaius Julius Caesar who nearly became Rome’s first emperor before being stabbed to death in the Senate, but rather for one of his ancestors. In Caesar’s time, cutting the abdomen of the mother to retrieve the child would have meant death for the mother. Advancements in medicine, especially proper hygiene, have, in the meantime, made the Caesarian section a viable alternative for women experiencing difficulty in childbirth and for baby’s experiencing distress during labor. The first record of a woman surviving the ordeal comes from 16th century Switzerland when a pig castrator aided his wife in delivery. The first successful C-section in America took place in 1794 by a doctor who performed it on his wife in what is now Virginia. Once meant as a life-saving alternative, today approximately 1/3 of all children in the United States are delivered by C-section. There are many reasons for this, many of them controversial. The typical indications would be an emergency or compromised health of the mother, such as hypertension, or the breech position of the baby (usually only 3% of babies are breech – i.e. not head-down the pelvis), but nowadays many C-sections are being scheduled to fit into busy doctors’ work calendars. In addition, the surgical procedure is more lucrative for clinics as they get paid more by health insurance companies for doing it and for the subsequent longer hospital stay of the mother than for normal vaginal delivery. Other woman may simply be afraid to go through the pains of childbirth. What is often forgotten, though, is that the act of childbirth has evolved to form a special bond between mother and child. While pushing, hormones are being released in the mother, and while traveling down the birth canal, the baby is also experiencing a flux of hormones which help it connect to its mother. The act of then placing the child on the mother’s breast strengthens the connection for both mother and child. Additionally, vaginal birth stimulates babys’ cardiovascular systems and exposes them to their mothers’ protective bacteria that strengthen their immune system. All of this is missing when a woman selects a Caesarian section. Rates of post-partum depression are higher in women on whom C-sections are performed and are believed to be due to the less contact a mother has with her child immediately following birth. Furthermore, when a baby is pushed through the birth canal, it expels the amniotic fluids that are in its lungs. Babies born via C-sections are more prone to respiratory infections following birth and to suffering from asthma in childhood and adulthood. Lastly, most C-sections are scheduled before the estimated due date which could mean that some babies, though near term, may not be fully developed. 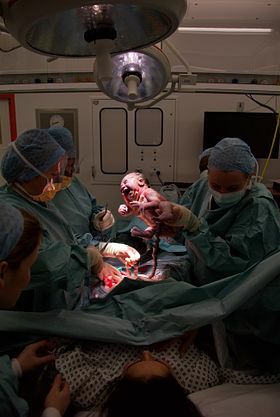 As glamorous as may sometimes be depicted, Caesarian sections are still complicated surgical procedures accompanied by many risks. The true medical need for one should always be discussed with one’s doctor. They have their place in the modern world and are sometimes necessities, but the fact that over 30% of American children are now born this way, and most of them by choice, is alarming. Just because a Caesarian section will not typically kill women like it would have in Caesar’s time does not mean that they should do it without careful consideration. Lurie, Samuel, M.D. The History of Cesarean Section (Obstetrics and Gynecology Advances/Surgery Procedures, Complications, and Results). Nova Biomedical, 2013.